Load me up with fruit in the summer and that’s all I need. But let’s not pretend we’re here for the “seasonal fruit” today. I am using the fruit as a vehicle to consume as much of this coconut dulce de leche as possible. Fact about me in case we’re ever on a game show together and you get asked what’s my favorite dessert. The correct answer is ice cream. Always and forever. If you want to get really specific, I love sundaes. 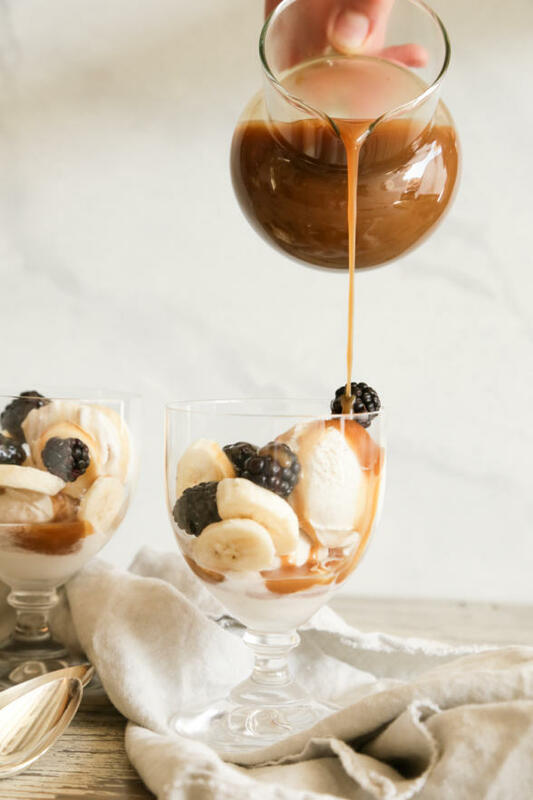 The roasted peach sundae with date caramel sauce in my cookbook is my favorite dessert ever. 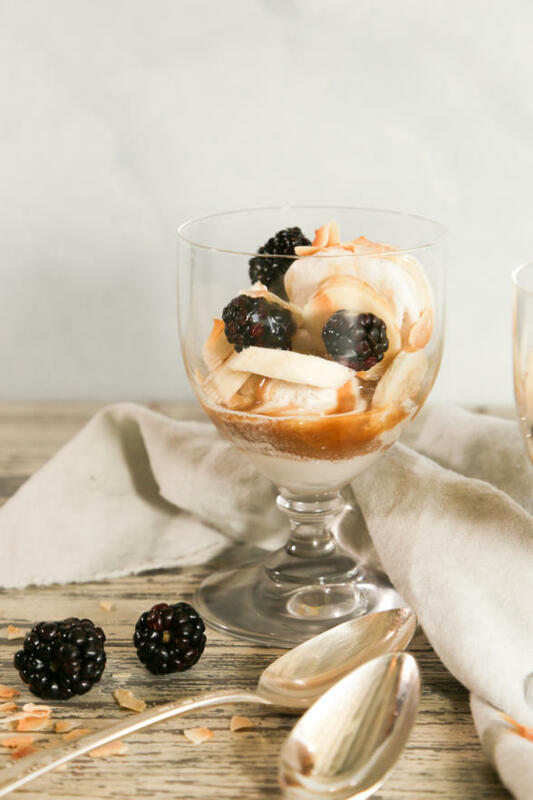 I love melty ice cream or frozen yogurt with something saucy like hot fudge or caramel and other things with texture, like fresh fruit, nuts or cacao nibs. Done. That’s it. Although truthfully, at this point in my life I am eating more “nice cream” than ice cream. And I’m ok with that. But when I want to really treat myself, I’ll make a sundae, even if it’s with nice cream or a high-quality vegan ice cream. And this dulce de leche is the icing on the cake…you know what I mean. Dulce de leche is similar to caramel sauce, but it is made by cooking down sugar and milk. You can make it on the stove (which takes a fair amount of stirring and cooking time) or with canned sweetened condensed milk baked in the oven. I am doing none of the above. Instead I am cooking down coconut sugar and brown rice syrup (the combination of which is both caramel-y and smoky) with coconut milk which is rich and thick. I like it better than “real” dulce de leche and it’s a heck of a lot easier and a little less bad for you. And no, it doesn’t taste like coconut! This lasts in the fridge for about two weeks. I also love it as a dip for fruit skewers or on frozen yogurt bark. Or swirl it into frozen yogurt popsicles! 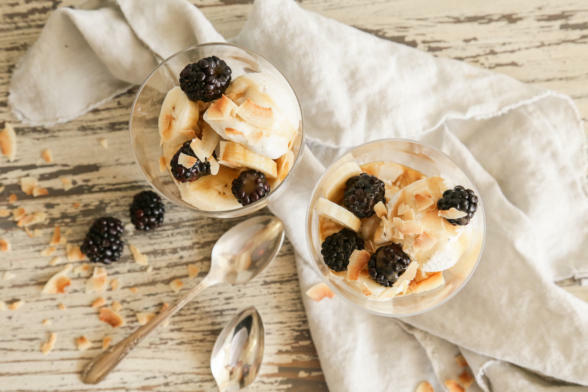 You can make this ahead and do a really quick sundae bar for an easy, no-fuss dessert. Expect to see a few of those this week while I’m on Long Island visiting my fam! 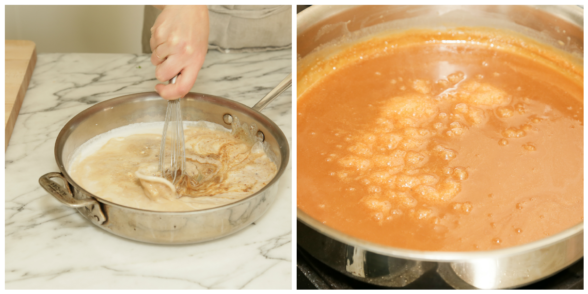 To make the dulce de leche, whisk all ingredients in a medium skillet (if you use a small pot, this will take longer than the recipe indicates) with high sides and bring to a simmer. Turn heat to medium low and continue to cook, whisking occasionally, until thickened, about 15 minutes. The sauce will continue to thicken as it sits off the heat. 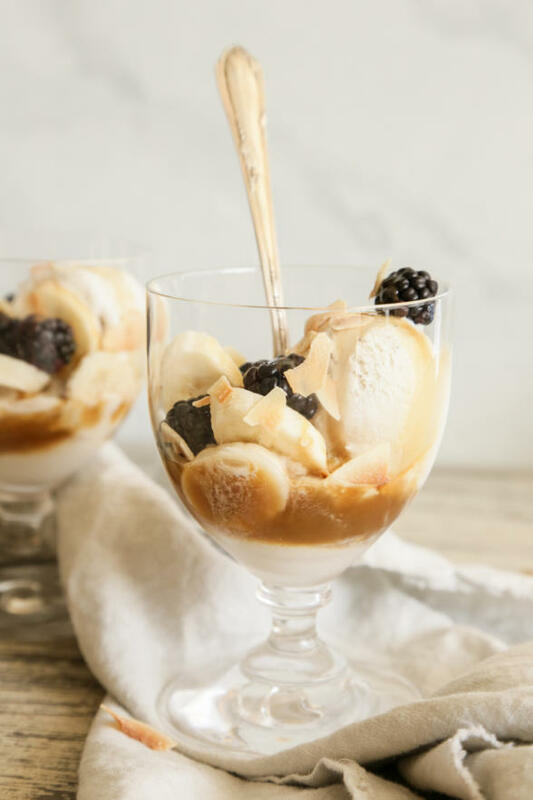 To make the sundaes, place a scoop of ice cream in each bowl, top with fruit and desired accompaniments. Drizzle with coconut dulce de leche. Love your recipes and your cookbook! It is my new reference book. When you say nice cream, what are you referring to exactly? Ah, yes! Am very familiar with banana whip. Recently made a faux Cherry Garcia using frozen bananas. OK, but not exactly Ben and Jerry’s! Thank you for your response!! My pleasure! Frozen cherries in nice cream is one of my top 3 faves! I’m right there with you on the ice cream. Any day. Everyday if I could. We have a new place in Temecula that serves ice cream and you can add a scoop of cookie dough to it. A little dangerous. “Nektar”is now serving vegan ice cream. They are introducing one new flavor every week over the next six weeks. My family and I will try any new ice cream place. Carmel is my all time favorite so I can’t wait to try this.